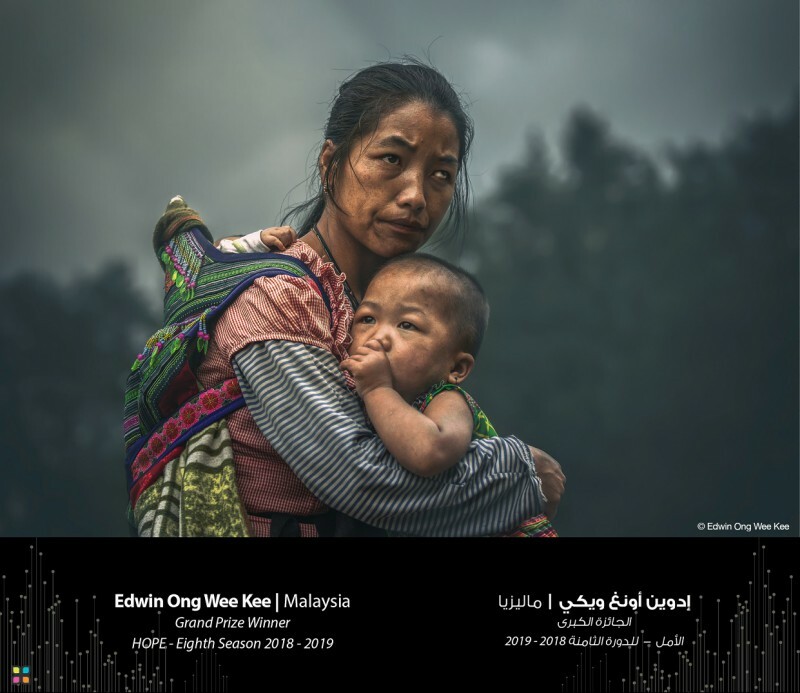 Malaysian photographer, Edwin Ong Wee Kee, recently won the US$120,000 2019 Hamdan International Photography Award (HIPA), one of the most valuable in the world, but has since been accused of staging his winning photo. The winning photo of the US$120,000 prize ($170,000) by Edwin Ong Wee Kee. Edwin has been described by organisers as documenting ‘an intense humanitarian moment’, with his photo showing ‘the feelings of a Vietnamese mother whose speech disorder did not prevent her from feeling hopeful and evoking a sense of strength for her children’. Following the award win, PDN reported the roadside shot was ‘not planned and came about due to an unforeseen stop’. However Bangladeshi photographer, Ab Rashid, uploaded a behind-the-scenes shot of what appears to be a photo tour group crowding around the posing woman and her children. Ab highlighted an individual in the crowd who he says is Edwin. Edwin, a keen enthusiast, is also a Chinese medicine physician according to PDN. Photo: Ab Rashid/Facebook screenshot. Petapixel reports that after she walked toward the group, she was asked if she would pose for portraits. Each year HIPA has a theme, with this year’s being ‘Hope’. If the accusations are true and this was a semi-staged photo tour portrait, is it worthy of receiving a US$120,000 cash prize? Most Petapixel readers said ‘no, never’. A poll had 77 percent of respondents – 5136 votes at the time of publishing – against awarding staged images. Interestingly, there is a minority who disagreed. Almost 20 percent, 1312 votes, said staged photos are ‘sometimes’ worthy enough to win a prestigious prize. Some may argue that given the villager was simply passing by and not hired or arranged to appear at the location, the photo isn’t staged or misleading. It may not be totally candid, but it’s still authentic. It’s worth highlighting that Edwin hasn’t broken any contest rules. HIPA, the ‘Hamdan bin Mohammed bin Rashid Al Maktoum International Photography Awards’, are the creation of the Crown Prince of Dubai and feature the world’s biggest single international photo contest prize. But it’s not a photojournalism contest. The award is described as supporting ‘art, culture and innovation’. The rules are relaxed, with nothing prohibiting staged portraits or preventing captions that would, as they say, ‘let the truth get in the way of a good story’. There are post-processing restrictions that prohibit editing which affects the authenticity of an image, or creates ‘illusions, deceptions, and/or manipulations’. While HIPA rules are not strict, in the past the contest has favoured documentary-style images. The prestigious 2019 judging panel included Time director of photography, Kira Pollack, and a group of internationally renowned photojournalists and documentary makers. 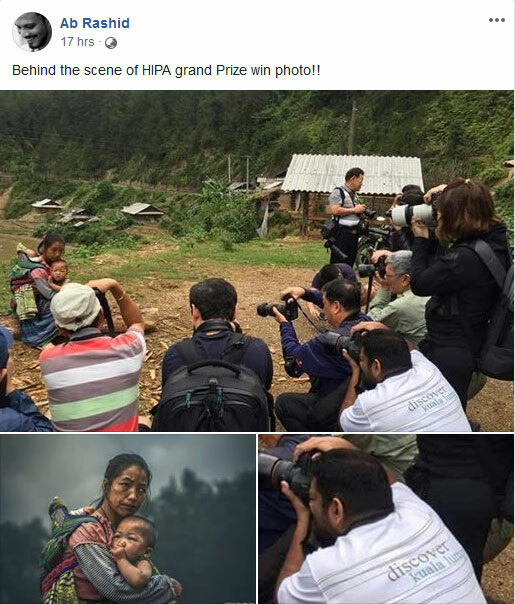 The panel may not have selected this ‘intense humanitarian moment’ for the top prize if they knew there were at least 11 other snappers swarming around the villager to capture similar shots. So far there’s been no response from Edwin, HIPA, or the judging panel regarding the accusations. 1. An obscene amount of prize money for a Photo Competition where the Crown Prince of Dubai can boast ” world’s biggest single international photo contest prize”. Bit like the Moran Prize where the size of the prize is paramount . 2. Wonder what the 2 guys photographing either side of the winner think of their tour mate’s big win. 3. Its not that technically good. The right hand side has been dodged and the dodge work on her left eye with a big brush is clunky for a $120K winning entry. She looks uncomfortable, and the wide shot of all of those photographers shows why. 4. Can’t blame the photographer for entering the shot. The judges, however, probably need to check bona fide’s before announcing a winner of this sort of prize money. The Hope the eludes me. Cant see that in the winning image. 5. Not buying the narrative that this image shows the feelings of “a Vietnamese mother whose speech disorder did not prevent her from feeling hopeful and evoking a sense of strength for her children’. I’ve been in Vietnamese villages taking photos and basically, they are shy and reticent to pose for our impromptu photo shoots. Not seeing Hopeful. And now, the big one… Is any of the prize money going to the poor mother in the photo? I cant imagine how a struggling Vietnamese villager would comprehend that by being confronted by a gaggle of photographers, one of them will receive $120,000 US for that brief encounter where her discomfort is exploited by a bunch of well heeled tourists. The winner may see fit to give some of his winnings to the villager. Hopefully. I think your observations are excellent, Angus – particularly the first and last one. I had similar thoughts while subbing the story. Thanks for taking the trouble to contribute. 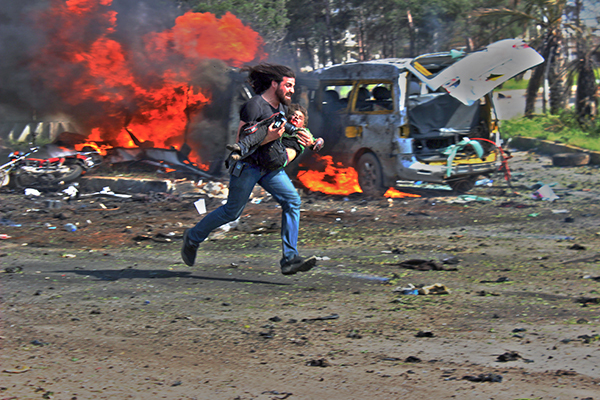 1- It’s not a photojourno prize, so perfectly acceptable as the winner I think. I agree that it may not be technically great, but it is a great photo. 2- As an ex-press photog, I know from experience what it’s like to be shoulder to shoulder with other ‘togs and see their photo published over yours. In one case like this, a colleague’s photo won a national prize, despite him admitting to me that my photo was far better (also entered in the comp) – I just happened to be in a much better position than him, even though his lens was 60cms from mine. It’s just the way the cookie crumbles sometimes.